Supporting local Aussie businesses pays off in so many ways. You can make a difference by shopping at small local stores this Christmas. For many people, Christmas finds them battling in the carparks in frantic last-minute, all-night shopping trips. We spend on gifts we think our friends and family would like. But where is our money really going? And where would we prefer it to go – overseas or right here in Australia? Can where you shop really make an impact on whether a small business lives or dies? Yes! 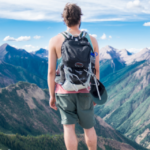 That’s what AMEX found when they surveyed approximately 1,000 customers and 850 business owners in August 2018: ‘The Economy of Shopping Small: Back Your Backyard’. Your shopping habits create employment opportunities and more shopping choices. And you – consumers and family members – give small business the most support. Even more than other large and small businesses. We’re not saying to buy local just because of that fact: don’t buy local if you don’t feel you’re getting anything in return for your hard-earned money. And every time we shop local, the buck stays here. The jobs stay here. Our kids’ footy clubs keep running. We can all enjoy Carols by Candlelight and New Year’s Eve fireworks at the park down the road. Every time we shop local, we make our community a hustling, bustling one. And in return, we find ever-increasing options to shop, work, play, eat – and everything in between. When we shop small, the small give back to our communities. 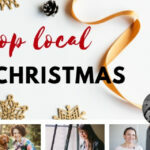 Local charities and community groups benefit: small businesses donated an average of $10,000 to local charities, sporting clubs and sponsorships of local groups or events. And more joy from playing a special part of a small business’ story. Oh yeah baby! They exist. This is the stuff every shirt-wearing dude’s dreams are made of. Now someone you care about can look cool, calm, and collected at important presentations (even if they don’t feel like it). Goodbye to embarrassing tell-tale dark sweat patches. But what rocks even more? He can toss the iron out! These shirts are so amazing! I bought one for hubby for his birthday. The material is amazing and he loves how the fabric feels, nothing like he’s ever seen before he said. We got an XL and it’s a really flattering fit. We’re both hopeless at ironing so it’s a win win that you don’t have to iron the shirts!! Jane Menz of John Miles Shirts is the goddess all the guys are bowing down to (and their partners – particularly if they used to iron for them). 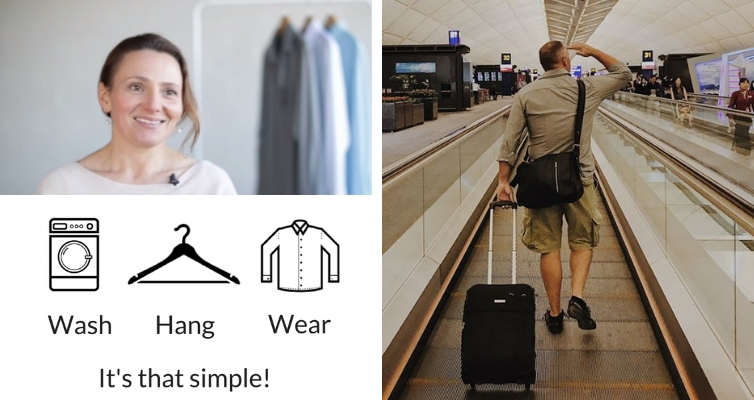 She conjured this one up after her husband struggled to find a comparable shirt in Australia that keep him looking good – and feeling cool – in hot humid environments. Watch Jane run through the scrunch test and sweat test. 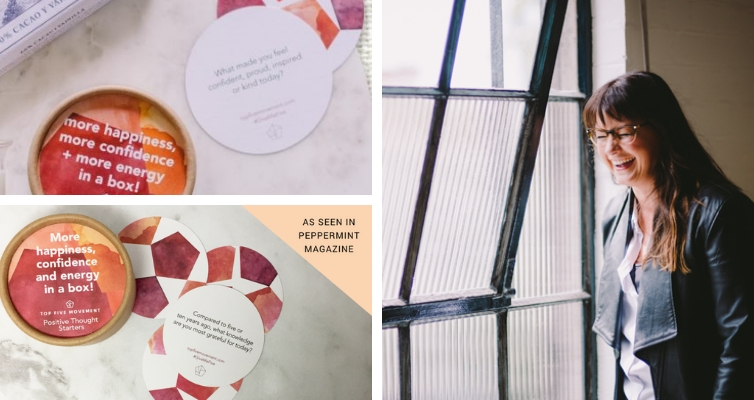 These positive thought starters are an easy way to find more happiness, confidence, and energy by looking on the bright side every day. Leave it on the bedside table and pull a card out at night to reflect at the end of the day. When I am feeling down or lost I choose a card and it always turns my day around. I love them. I also have some to give for birthday presents. They are such a great gift, uplifting, inspiring and motivating. These little boxes of joy are the creation of Clare Desira at Top Five Movement. After a particularly tough time in her life in 2006, she began writing her top five moments of happiness every day. This began her movement to inspire millions of people worldwide to add more helpful, productive, thoughts into their minds. Check out Clare’s TEDx talk: Honesty and the Top Five Movement. 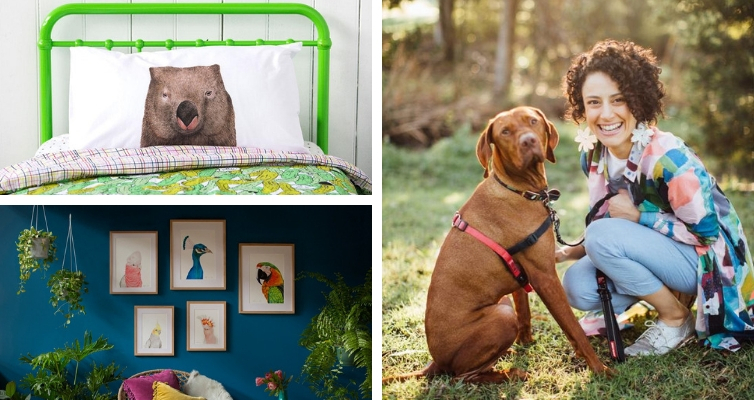 Bring a world of warmth and wonder into your home with homewares brought to life by big personalities such as Toby the Giraffe, Kev the Koala, and Garry the Galah. …these adorable Australian cards and prints have just arrived in store making us smile, and then frown over which to choose… Winston the Wombat has pretty good game. Danielle Leo (‘Dee’) of For Me By Dee is a self-taught watercolour artist and encapsulates everything about her creations: warm, happy, and bright. Winston the Wombat made his way into TV series The Block in 2017. Dee keeps good company while painting with her loyal Hungarian Vizsla dog, Riggs by her side. 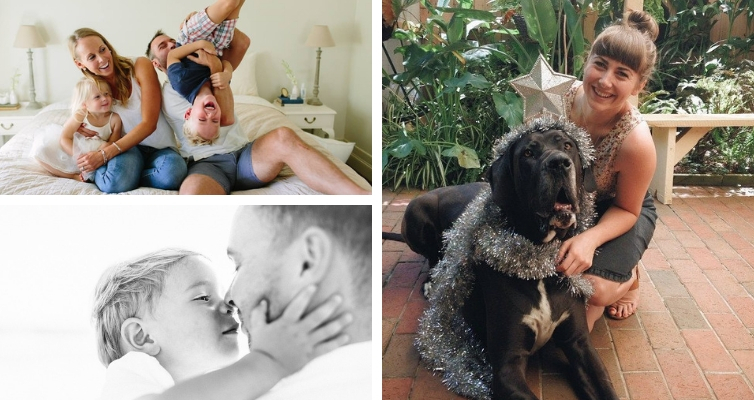 Photos: Precious moments captured. Founder and photographer/videographer, Emma with dog Dutch. Source: Haven Still and Moving Images. Moments with family are priceless. 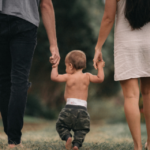 It’s worth capturing a few now and then, and a natural family video is a wonderful way to to do it. Expect a comfortable and fun session hanging out with family or friends while every little look, loving gesture, and laughter is captured. The soul behind the camera is Emma Buglisi of Haven Still and Moving Images. Emma is used to being in the background: her enormous great Dane, Dutch, is known for stealing the show. 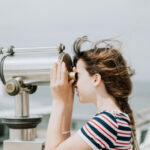 Now and then she manages to drum up some attention: this year she was finalist for her video El Camino in the Setting Sun Film Festival’s Documentary Award. I really appreciated your warm and personable style in our communication, promptness with the project, and openness to feedback about the style and format. My partner was moved to tears when he watched it (& within 5 minutes wanted to watch it again!). This montage will be a timeless treasure for us both (as well as family and friends who are all really keen to have a look). This handmade, imperfectly perfect sake set is the ultimate way to relax after a long week. The sake will go down more smoothly, and the company will be more awesome with these in your hands. Tian You of Tian Ceramics moulds every one of her ceramic pieces with plenty of love, and a whole lot of thought. Think no-spill pouring, comfy handles, and yes to the dishwasher. 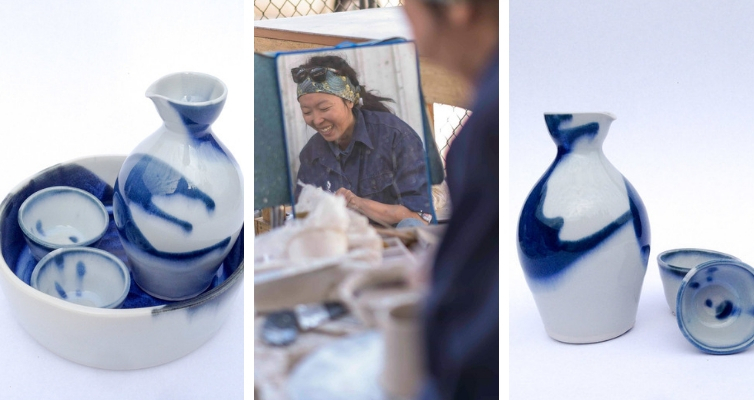 She was awarded an Excellence in Design – Functional in The Teapot Exhibition in 2018. Yeah it’s really a thing! Photos: Self care. Yoga class. Founder and yogi Mark. Source: Westside Yoga. Know someone who needs to de-stress? Help learn how to create the perfect conditions for their nervous system to rest and restore through yoga and meditation. 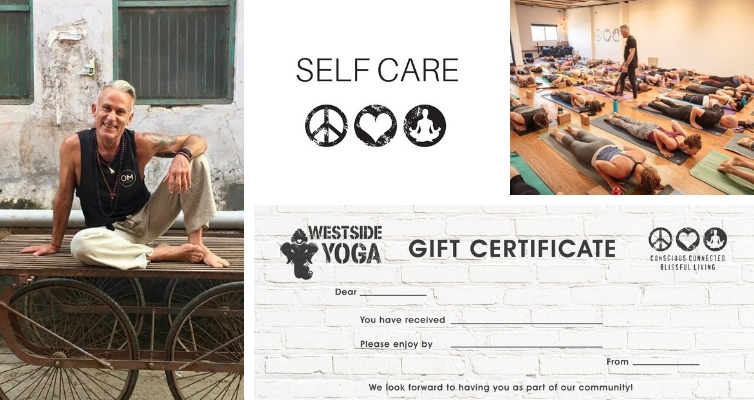 Mark Pheely and the team at Westside Yoga in Seddon, Victoria sees yoga as a lifestyle, rather than a job. They are warm and approachable. They recognize that yoga and meditation isn’t just about ego-driven poses or feeling bad about the racing thoughts in our minds. It’s about gentle acceptance, and nurturing the mind and soul. Connection and community. The class though packed was super zen with some really intense stretching and beautiful meditation. One of my favourite classes. Photos: The cheese board is a bestseller. Metal sign. Founders and laser cutters, Mel and Ben. Source: Sherlock Designs. Here’s a gift idea your receiver is sure to appreciate. These unique wooden cheese boards will add something special to their next dinner party. The boards are laser-cut with the quote “If you can read this you’re running out of cheese”. 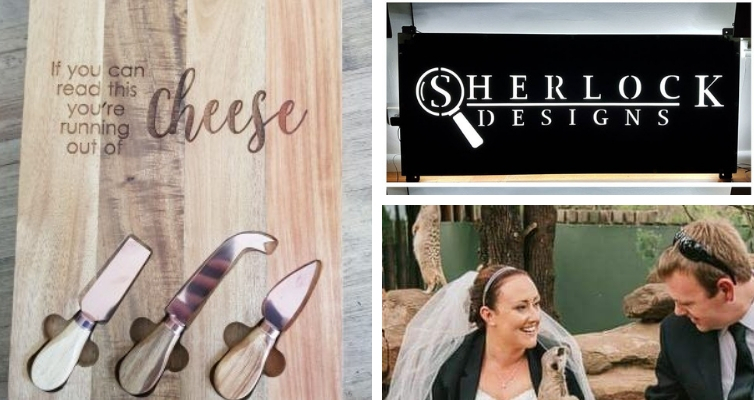 Mel and Ben Sherlock are the creators behind Sherlock Designs laser-cutting. Their first preference is to source local and they meticulously hand make most of every item the sell. They’ve built a loyal following who especially love their Game of Thrones and Harry Potter items. ordered from Sherlock designs and not only are the things I purchased awesome but they have arrived so quickly and packaged well so that everything arrived in perfect condition. one of my items was even customised! ❤️ about to put a second order in! Photos: Australian rose embedded in resin. Founder and maker, Lucy Genat. Source: Tree Fern Designs. 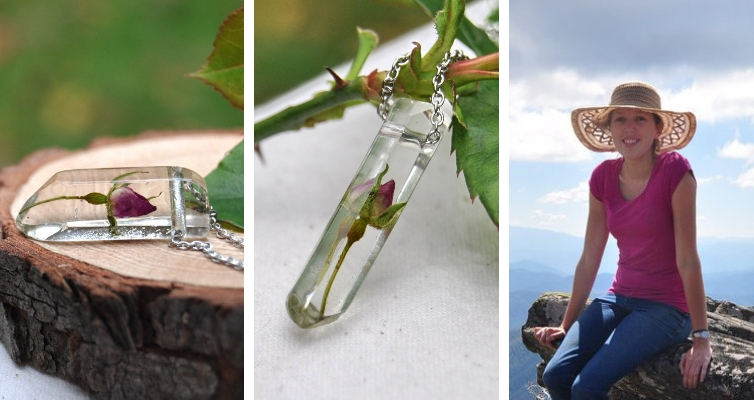 Your recipient will love wearing this beautiful piece that’s as personal as they are: every rose bud is real, picked from the creator’s own garden (in Warburton, Victoria), and a layering process ensures longevity. Lucy Genat from Fern Tree Designs comes from a family with a love of flowers – her parents own a cut flower farm in Gembrook, where she also picks flowers for her pieces. She skillfully hand makes each piece one: making moulds, layering resin, and sanding for a perfect finish. Breathable and light, this ¾ sleeve tee will make outdoor play comfy for your young niece, nephew, or best friend’s munchkin. It’s simple, super soft, and made of organic cotton to keep the littlies cool and protected, especially in warmer months. Owner and designer Elise Clarkson from Wild Mountain Child knows all about the importance of comfort and practicality playing outdoors. She lives in the beautiful Blue Mountains with her family. 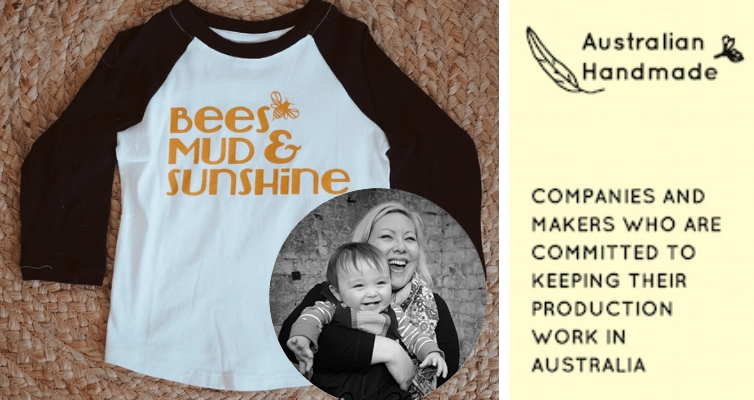 Her products are for littlies and her ethos is lofty: to stock eco-friendly, fair-trade, Aussie handmade items with an attitude of giving back to planet or people. Photos: Learn to draw for business or pleasure. Founder and teacher Tatyana Deniz. Source: Kawaii Drawings. ‘Kawaii’ is Japanese for cute.Think cupcakes, ice creams, and cookies with loads of personality. This 21 day step-by-step course is perfect for that someone who wishes they could draw – for business or pleasure. The best thing about kawaii is: the more imperfections, the better the drawing. 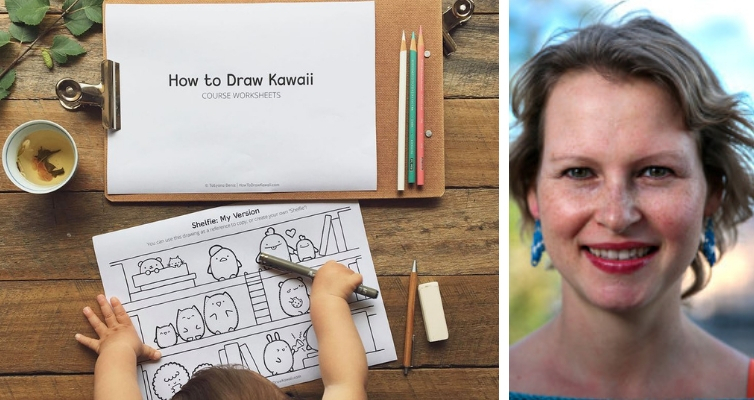 The lady behind the cuteness is Tatyana Deniz at Kawaii Drawings. While relaxing at a cafe with a coffee during bubba’s nap, she wished she could doodle her time away with fun, gorgeous pictures. Four years later, she’s inspired thousands of people to draw, and her tutorials are about to be published in the Kazoo Magazine, in New York. I wanted something easy to do, yet cute and fun. And something that an adult would enjoy. That’s how I came across Tatyana’s tutorials, and I was thrilled!!! I love her drawings and how easy it is to follow her instructions. I now draw almost every day! I love being able to make something cute, in a short amount of time. It gives me confidence. It has helped me physically and mentally. It takes my mind off things and puts me in a happy place. I love it!!! Thank you Tatyana! It pays to shop local. Because who doesn’t want to feel special? That’s what local small business do well: make us feel special. Tell us what we want – before we ask for it. Let’s make them feel special too. Because many small businesses struggle more than we realize. They work excessive hours (and another job). They pay everyone but themselves – 34% of business owners dip into their savings to fund the business. There’s always something to worry about. Often they’re running from passion and dedication. Yet even as they struggle to stay afloat, they wouldn’t be doing anything else. They plough billions of dollars back into their local areas through supplier payments, staff wages and donations of money, goods and services. It’s no wonder many small businesses fail within their first year. They will fail without your support. But that doesn’t need to be the story. You can change the story of your small business locals. And we’ll all have a Happy Christmas.